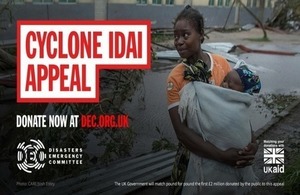 The UK will double the first £2 million of donations from the British public to the Disasters Emergency Committee’s (DEC) Cyclone Idai Appeal, bringing the UK’s total response so far to £20 million. International Development Secretary Penny Mordaunt has today (20 March 2019) announced that the UK will match pound-for-pound the first £2 million raised by the generous British public for DEC’s appeal, to support those affected by flooding in Mozambique, Malawi and Zimbabwe. This new support, from the UK’s Department for International Development (DFID), will double the impact of the public’s donations and ensure that charities working on the ground can reach the vulnerable men, women and children who have been left homeless and in urgent need of food, water and shelter. The UK sent humanitarian experts prior to the cyclone making landfall, and this latest package of support comes after the UK increased its direct support by £12 million, bringing the total UK aid support to £20 million to save lives in areas devastated by rising flood waters. This is on top of substantial existing support that the UK is already providing through its core funding to partners on the ground, including UNICEF, the World Food Programme and the International Red Cross. Donations to the Cyclone Idai appeal will be matched through the UK Aid Match scheme. Through UK Aid Match, DFID gives the British public the opportunity to decide how the UK aid budget is spent and support people in desperate need by matching their donations pound-for-pound up to £2 million. This has increased the impact of a number of DEC appeals to help those in need around the world, including most recently to support people affected by the earthquake in Indonesia.